MIAMI (AP) — Dwyane Wade arrived for work on Sunday not expecting to play much, if at all. His bruised right hip was sore and he was feeling pain with every step. “Just thankful I could go out there and contribute,” Wade said. He did more than contribute. Even with the bad hip — hurt on a hard fall Friday night in Miami’s loss to Milwaukee — the 6-foot-4 Wade won a jump ball against Frank Kaminsky midway through the fourth quarter after hitting the floor for a tie-up, then blocked a layup try by Dwayne Bacon about two minutes later and hit a 3-pointer on the ensuing Heat possession. It was an ugly win: The 168 combined points was the lowest in the NBA this season. Orlando and Chicago combined for 170 on Dec. 21. Charlotte’s 75 points were a season-low and tied the third-worst total in the NBA this season. “In the fourth quarter we couldn’t make a shot,” Hornets coach James Borrego said. Hornets: Cody Zeller (left knee soreness) did not play. “There’s still swelling there that we have to be cautious with,” Borrego said. … It was the 36th and almost certainly final time that Tony Parker got to play against Wade, including their NBA Finals matchups in 2013 and 2014. … Charlotte hasn’t won twice at Miami in the same regular season since 2001-02. The Hornets could have changed that Sunday. Heat: Justise Winslow (right thigh bruise) didn’t play. .. Josh Richardson was 2 for 17, 0 for 9 on 3s. … Waiters was 4 for 5 on 3s after halftime. … James Johnson played for the first time in 12 games, after missing time with a shoulder issue and then falling out of the rotation. He played the entire fourth quarter, making a pair of 3s. There have been five games in the NBA this season where neither team reached 40 points by halftime — and Miami has been in three of them. 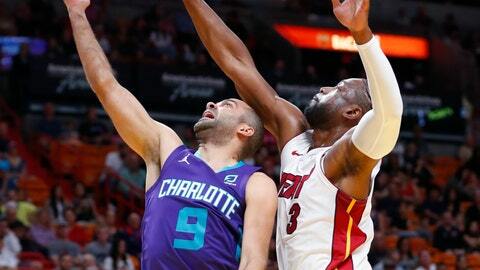 The 39 points tied Miami’s fourth-worst first half total of the season, and was Charlotte’s third-worst total.